San Diego’s Nadia (NadVal) created her own version of Belted Kingfishers for the art competition at the San Diego County Fair. 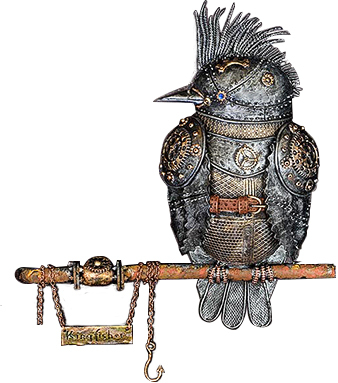 Her polymer kingfisher flies with a steampunk flock. The real species is one of only a few whose females have plumage brighter than males. Despite the warlike appearance, this one is female. And she’s a prize winner. The framed bird took the top prize in the show. Read more about the bird on Nadia’s site, Flickr and Facebook. This is terrific and utterly charming! Congratulations! Stunning piece, many congratulations, very well deserved. I love this kingfisher! Like a knight in shining armor! Way to go. This is amazing and an innovative take on steampunk. Huge congratulations on the San Diego Fair win! Totally earned and deserved! Wow! That hit me like a brick when the PCD page opened. Definitely deserved it’s win. Congrats, Nadia.